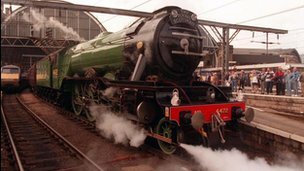 The restoration of the Flying Scotsman is unlikely to be completed before 2015, the National Railway Museum (NRM) has confirmed. The museum in York said an independent report had identified substantial further work including the removal of the boiler and steam cylinders. Restoration work has been hit by numerous delays since the museum started work in 2006. Work on the steam engine has so far cost almost £3m. The engine, the first to be officially recorded at 100mph (161km/h), was bought for the nation in 2004 for £2m. The initial cost of restoring the engine, built in 1923, had been put at £750,000. It had been expected the engine would be running in time to participate in last year's Olympic torch relay but the NRM was forced to withdraw it. An engineering consultancy firm, First Class Partnerships, was asked last October to give an independent review of the work needed to complete the project. It concluded the remaining work should be carried out by an external company rather than by the museum's in-house team of engineers. The NRM said there was also a small section of the main side frames that could not be examined until the steam cylinders are removed. It added a final assessment of the viability of the restoration could not be made until the condition of the that area had been assessed. Paul Kirkman, director of the NRM, said: "It was vital that we really got to the bottom of this complex project. "We will now progress cautiously towards completing the restoration, subject to reviewing the condition of the main side frames."